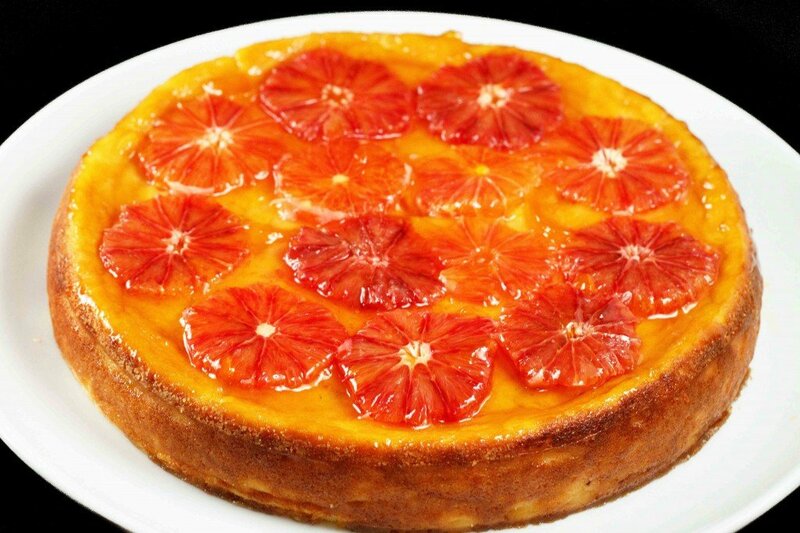 This Blood Orange ricotta cheesecake is perfect for the holiday season. I remember my first encounter with blood oranges, we were in Rome and it was Christmas day, and had gone down to breakfast in our hotel before heading out to the Vatican to see Pope John Paul. It was a continental breakfast with delicious pastries, cheese, fruit and of course juice. I decided to start with juice and the offerings were a reddish juice that assumed was pink grapefruit, and a normal orangish juice, that I of course assumed was orange juice. After tasting what I thought was orange juice, I knew had made a mistake because it was grapefruit juice, and when I questioned our server, I was told the other red tinged juice was, in fact, blood orange juice. It was love at first taste! After all these years, I still wait for blood oranges to come into season, they’re available in the US from November to May and are grown in Texas and California, the cooler fall and winter nights help develop the distinct maroon color. The varieties grown in the US seem to vary in sweetness, but It really doesn’t matter to me if they’re not as sweet as I remember, because the memories are…..sigh The best blood orange juice I ever had was in Pompeii from a little cart where it was freshly squeezed while we waited, it was so good I went back for more. So you see even if our blood oranges aren’t as sweet as those grown in Italy, my memories add more sweetness to them! This year’s blood oranges proved to be a little on the tart side, but the color was beautiful and having bought more than I would eat, I knew I had to come up with a good use for the remainder. It really was an easy decision, they would be a wonderful addition to a ricotta cheesecake! The tart-sweet orange with its hints of raspberry would be the perfect compliment to my ricotta cheesecake, and the color of the blood oranges would be a delicious contrast from the pale creamy color of the cheesecake! Ricotta cheesecakes are not for everyone, and honestly, I do still enjoy a New York style cream cheese cheesecake, but every now and then I miss that flavor and texture of a good ricotta cheesecake! 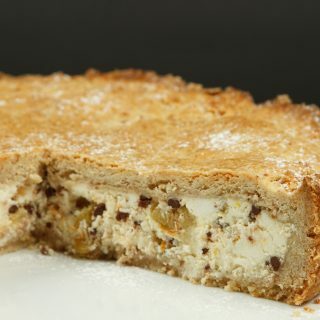 I find that by using mascarpone it smooths out the texture and adds some richness to the dessert. Feel free to use cream cheese if you can’t find mascarpone it will still be a delicious alternative to the New York style cheesecake. 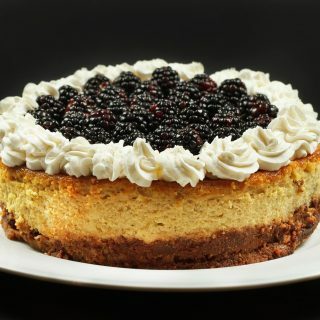 You might also like this Ricotta Cheesecake with Blackberries. add melted butter and combine. press crust into the bottom of prepared springform pan, and partway up around the sides of the pan. Bake crust for 7-10 minutes, and allow to cool. In the bowl of your mixer blend together the ricotta cheese, mascarpone, and Greek yogurt blend until smooth. Add sugar, flour, salt, grated lemon peel, lemon juice, and vanilla. Blend well until very creamy. Pour mixture into a prepared springform pan and Bake at 375 degrees for 50-60 minutes or until the cake has set in the middle. The top of the cheesecake can get brown, if you are not topping it or prefer a lighter top, cover with foil for half of the time in the oven. after allowing the cheesecake to cool, place the orange slices on the top of the cheese cake. using a pastry brush, brush the marmalade on the oranges and all exposed areas on the top of the cheesecake. Use enough of the marmalade so it has a nice glaze. * I used Italian lemon cream cookies for my crust. Normally I use digestive biscuits, but you can also use graham crackers, or go crustless. *Cheesecake needs time to set up, I would recommend a minimum of 6 hours refrigerated before serving. Previous Post: « Berry Citrus Bread with Eat. Drink. Love. 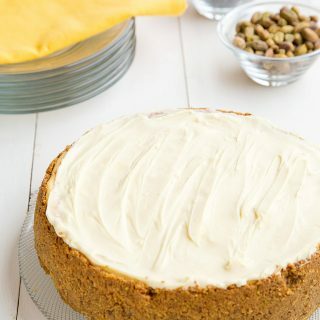 can you tell me the size pan to use for this ricotta cheesecake? can the recipe be doubled for a larger cake? and if so what would be the cooking time? I have made your tiramisu and it was a hit at a holiday dinner. thank you so much and have a Happy and Blessed Holiday! I use a 10-inch springform pan. You can double it for a larger cake but it can affect how it cooks and you can end up drying out the outside while the middle cooks. If you want to make it larger I would suggest using a baking rectangular baking pan so it cooks more evenly. As for cooking time if its a rectangular pan, it shouldn’t take too much longer but the best bet is to check the middle with a toothpick to make sure its done. I love ricotta and use it a lot in my cooking. This cake looks amazing and I like the combination with the oranges. Chef, you have our hearts in your kitchen. Cheesecake and blood oranges, how is it possible to have anything so good this side of heaven? Congrats on the Top 9 yesterday, beyond well deserved! Hope you and yours are well and the back’s not giving any problems. I don’t normally comment on ‘dessert’ posts because I don’t bake and I don’t have much of a sweet tooth, but this stopped me dead in my tracks. It not only promises to be delicious, it’s gorgeous to look. Way to go, Dennis! i’ve never even heard of ricotta cheesecake! sounds like it would be lighter than the normal (too dense for me) cheesecake. gotta try this!! Blood oranges are so beautiful. I always get excited when they are in season, too. And I can honestly say that I have never tried a ricotta cheesecake. Sounds intriguing!! yogart omg that is awsome lower fat and sugar as well as calories.. cant wait to try it.. This is absolutely a cracker! I love the oranges, ricotta and cheese cake!! YUm!! I really like your blog! Buzzed you too! This looks delicious AND amazing! I love ricotta based cheesecake, so light and the addition of blood orange sets it off beautifully. Excellent post! This is beautiful and sounds so delicious! This another gorgeous cheesecake from you. I love the Blood orange topping which pairs well with the cheesecake. I just found blood oranges in Indy last year!!! 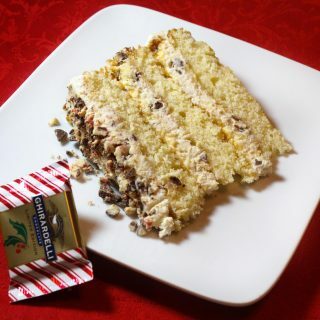 So delicious…as must be your gorgeous cake. We’re having thunderstorms at 7 AM here….55º, wind and torrential rains. Crazy for January! Have a great day and congrats on the Top 9! Piece of art..very beautiful and delicious at the same time! I love your photos! Congrats on well deserved top 9!!! Chef Dennis this is really amazing. Like to die for. I just scored some myself and could not wait to use them. Mine were a touch more bitter too so maybe it’s an off season or something. I hope not. I must try this out. It’s really breathtaking. This cake is just gorgeous, Chef!! I love how vibrant the oranges are! And I love ricotta cheesecakes! I love ricotta cheesecake. I think this will be a sure step up! Thanks for sharing the great idea! And, no matter how mild the winter has been up till now, it is still painful when it strikes back. Another beauty. I love blood oranges, and I can’t wait to try adding them to a cake. Sorry I’ve been a bit absent lately. I’m try to get into the swing of a new work schedule. Please know that you and your blog are some of my favorite parts of the week. I hope you are having a delicious day! I have never eaten one coz it is not available in Malaysia, but from the way you described it, it must be good…tart sweet orange with its hint of raspberry…mmmm I am sure I would love it if I can hold of it here 🙂 Thanks Chef for sharing another winner with us . Have a nice day! I have never tried a blood orange before. You make them sound good though, I am going to have to see if I can find them!! Those sliced oranges almost look like flowers. Just gorgeous. You rock my world. Seriously. Amazing. That is just gorgeous to look at, and I bet a super pleasure to eat! I mean devour! I love blood oranges. I wouldn’t be surprised if California blood oranges are tart this year. We haven’t had a lot of cool nights yet. The cheesecake looks beautiful. This sounds wonderful, Chef Dennis. 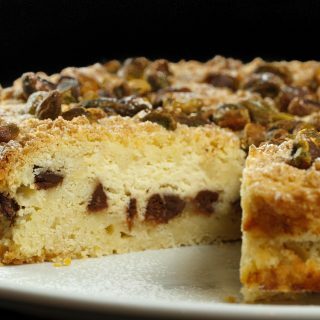 I LOVE a NY style cheesecake, but I’d be willing to try a ricotta version if it looked and tasted like this one. Wow. The color is fabulous. WOW, Chef…that is amazing. So nicely done, I love the color of the cheesecake. So bright and sunny. Makes me a little warmer on this VERY cold day in the Northeast! looks absolutely stunning. I would love to try this! unfortunately blood oranges are a little hard to come by where in my city, though i’m sure i could find them if i looked hard enough. The cheesecake looks delicious! I now am on a quest to get some blood oranges here and also plant them since I already have 4 varieties. I hope I could get the correct name in spanish. Thanks Dennis for the wonderful recipe, have a great week. I’ll bet the lemon cookie crust is amazing. I’m one of those that loves the crust as much as the filling. This is a refreshing and beautiful dessert. This is absolutely gorgeous! I’m going to try it but I have my doubts if mine will be as beautiful as yours. 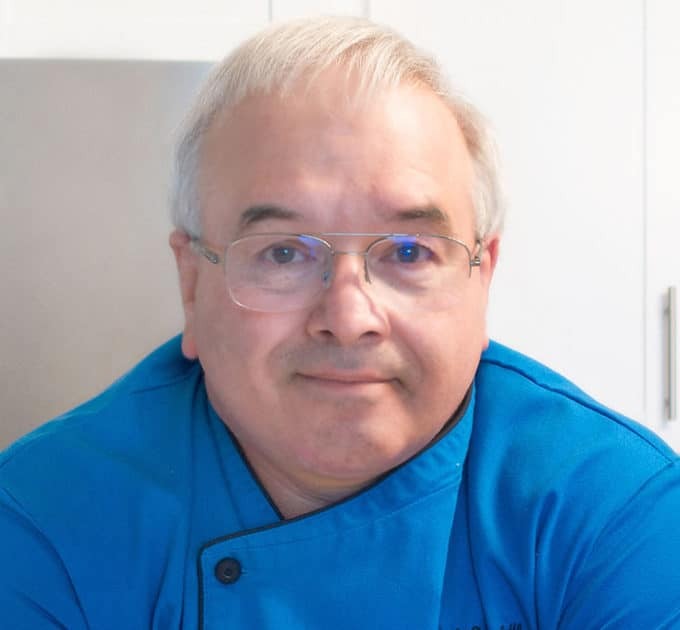 You’re a clever chef! I never knew blood oranges were grown here in Texas, I have been missing out. I will need to get a few just to taste on their own first and definitely some extra to make this lovely cheesecake. 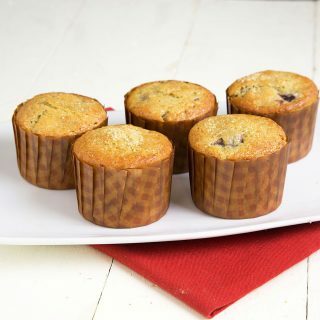 The texture of the piece shown in the picture tells all-simply delicious. Have a great day Chef! This is beautiful Chef. I’ve never had ricotta cheesecake before but would say yes to this dessert any day. This is a really beautiful color. 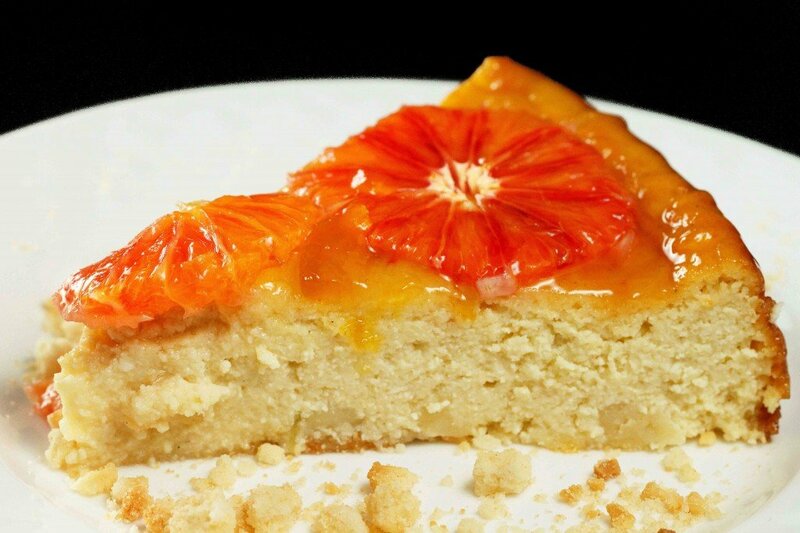 I bet the tartness of the blood oranges work really well with the ricotta based cake. Lovely! I never ever had a blood orange before or a ricotta cheese cake but you did such a beautiful job that I really want to give that a try! I have a local market that I get my produce from and I will ask them to point me towards them. At this market they even cut right into anything I want and let me try it first! We need to give this a shot. I hope you have a good week my friend! This is a stunning cheesecake! When I lived in Sicily, I lived right next to a blood orange grove and an olive grove…they were everywhere and oh, so delicious! Now that I live in Florida – I can’t find them anywhere! I guess it’s time to hit a different grocery store….I know Honey Bunny would LOVE some! Oh, that is gorgeous! Here’s a sad, sad fact, I have never had a blood orange. We just don’t get them readily here in Washington, it seems. I look every year and never find them, so I guess I need to get serious and head to Whole Foods. Thanks for the recipe! Just breathtaking, Chef! You never cease to amaze me! Wow! This cheesecake is absolutely stunning! I’m not much of a orange fan, but this just might convert me! I’ve never had a ricotta cheesecake either, but am certainly eager to try it out! You probably enjoyed the Sanguinello in Italy, whereas most blood oranges grown in the U.S. are the Moro variety. Both are good, but the Sanguinello is more consistent with color, acid and sugar content. If you ever see the Cara Cara Pink Navel (orange), buy it. It’s the most succulent citrus out there. Wonderful cheesecake, by the way. I love citrus season.